Tafeda is a family-owned company that runs a paper embossing business based in the Shoalhaven. By applying nearly 30 years of experience in the paper industry, the company founders have developed and are expanding a unique service to customers across Australia from their factory and showroom facilities at Flinders Estate, South Nowra. Leaving behind families, Fernando and Teresa Del Castillo, with sons Daniel (then aged 5) and Fernando Jnr (aged 3), migrated from Peru to Tasmania in 1990 in search of a prosperous, peaceful and secure future. With little English skills at the time and Spanish as their native language, Fernando and Teresa quickly secured employment at the Burnie Paper Mill, management there identifying their professionalism, education, motivation as well as their Peruvian paper industry background. 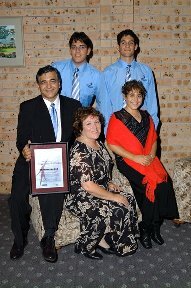 After five years in Burnie and following the birth of their third child, Ana Maria, the family accepted relocation to the Shoalhaven Paper Mill. This paper mill specializes in producing specialty grade papers. With their wide-ranging understanding of operations at this paper mill, Fernando and Teresa realised the Australian paper market was only supplied with specific embossed products and these through paper merchants and printing houses. This, they realised, restricted the consumer to a limited range of embossed products. With this insight into the paper industry, Tafeda was created to help supply custom embossed products to what Fernando and Teresa identified as ‘a huge market made of several smaller segments’. Operations first began with Fernando designing and building his own embossing machine - a reel and sheet fed embossing machine he assembled in a small shed at Culburra with the help of local, highly qualified and experienced trades people, who fabricated the components from the given drawings. With the support of Shoalhaven City Council, Tafeda was able to relocate to South Nowra where the factory, offices and showroom have been built in separate stages. A fourth building stage is currently being planned - to help accommodate a fifth paper embossing machine that is being built in-house by the Tafeda team and to create space for future growth in the business. Their business success has been built on teamwork, with Fernando’s and Teresa’s professional training and background experience in the paper making industry complementing each others. Their three children are already actively involved in decision-making and factory operations. Responding to the demands from the fashion paper market, the Tafeda team is constantly upgrading and modifying machinery. One of the current projects is to double the speed at which the reel fed machine can emboss and rewind a continuous web without reducing quality. The business will remain in Nowra. It is being positioned to support Fernando and Teresa in their retirement while allowing the company to grow with the help of their children Daniel (a mechatronics engineering graduate from the University of Wollongong), Fernando (who completed his mechanical engineering degree at the University of Wollongong the day his parents were being interviewed), and Ana Maria (still a secondary student but already an elite swimmer and volleyball player and a budding artist). The children have assisted in the growth of the company by helping at trade shows in Sydney (2003 and 2007) and Melbourne (2005), along with other day-to-day tasks at the business. Their knowledge of the products and operational capabilities is constantly developing through involvement in the family round table where discussions and business decisions are made. Their success has come from identifying a niche market that supplies to paper merchants, printing houses, glossy magazine publishers, greeting card manufactures, corporate publications, specialist printers, corporate wrapping to chocolate manufactures, the label industry and many more. Many of the products that Tafeda embosses end up as finished goods in shops across Australia. 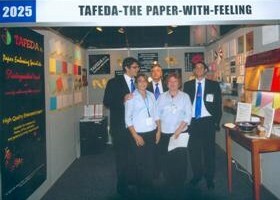 Tafeda’s slogan “Paper with feeling” comes from being able to apply their dream, passion and uniqueness to a high quality and demanding industry. Since Tafeda does not sell a product in itself, rather a concept, it allows their customers to be unique and distinguished from their competitors.